The info below have not been validated yet, so don't hesitate to complete / correct / improve them, thanks! Remarks: With a bit of experience, it's a very good way to make plenty of money! Tips: There are certainly many good starting positions. A good one is to stand between the wooden statue on the right and the rock that sticks out of the snow in the middle of the track (right on the right of the "path"), to make a few steps forward, to aim at the bump on the "second level" (a bit below the start) and the centre of the pins, then to place the snowball down. Remarks: Make sure you bring enough arrows. 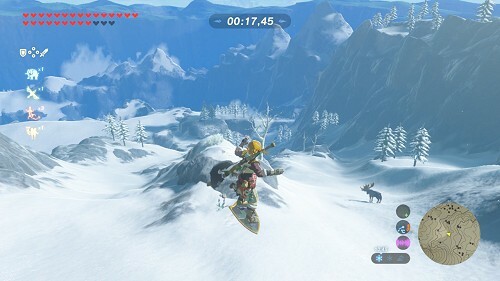 Tips: To hit the deers more easily, don't hesitate to jump from the top of the cliff for the "bullet time" effect. Goal: Reach the flag at the top of the hill before Konba does. Remark: Beware of the enemies, the falling rocks and others explosions along the way! Tip: You just have to follow the path, nothing complicated. Indeed, the bigger your stamina container, the easier the game. Goal: Glide with the Paraglider as far (and as long) as you can. Consolation prize: 50 rupees for a score between 500 and 599 meters ???????. An ingredient ?????????? Remarks: You have to have at least two full stamina containers + 2 small portions. Be careful, if you turn around, the counter decreases! 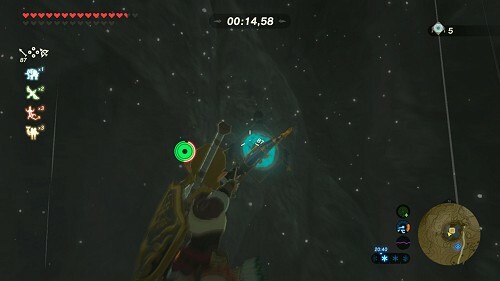 - The most efficient way is to aim at Hyrule Castle, to take the path the most at the bottom of the cliff between the castle and you so you don't land on it. 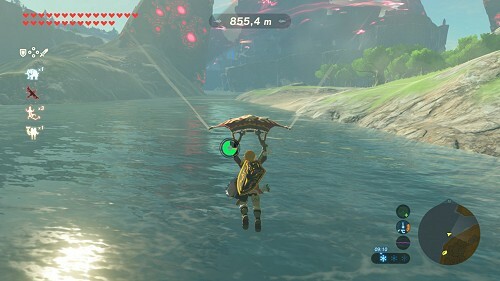 - Use Revali's Gale before you take off to optimize your flight and get some more meters. Try to take advantage of the wind to fly in the same direction. 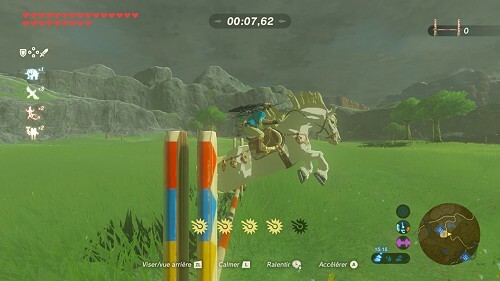 Goal: Cross 10 obstacles along the track before going back to the stable under 1m30 then 1m15. Prizes: Extravagant Saddle and Extravagant Bridle. Then, an Endura Carrot if the track is completed under 1m30 and a silver rupee if under 1m15. Consolation prize: Some Swift Carrots from what score on ??? Remark: You can cross all the obstacles under the required time without having to gallop! Tips: Take a horse with some good stats and with maximal affection. Get right in front of each obstacle and most of all don't gallop while taking the bends. Goal: Destroy 20 balloons along the track in less than one minute. Remark: In the middle and at the end of the track, there are several targets next to each other (2 in the middle and a group of 5 at the end). 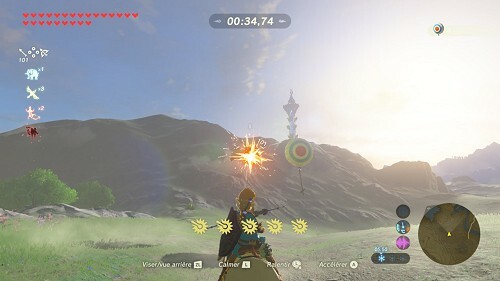 To save some time, just hit a target with a Bomb Arrow! Tips: Like at the Horse Race, the horse you choose is important. The bow you choose can also change things. 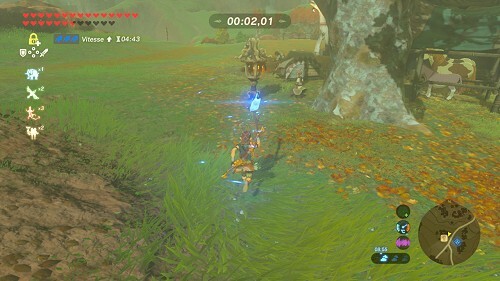 Keep in mind to gallop from time to time, otherwise you won't have enough time to finish the track. 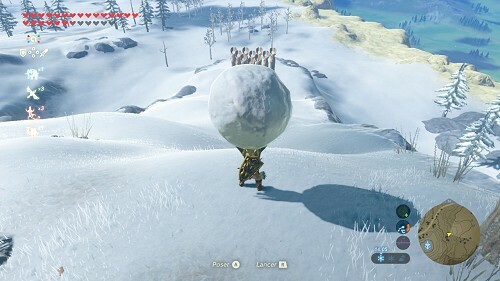 - To snowboard on your shield you have to "protect", jump, then press "A". 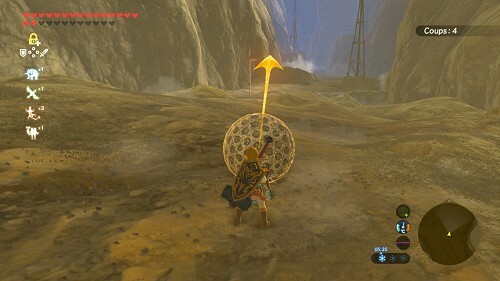 Be careful, it uses the shield! - There are two courses: "Basic" and "Advanced". Once you've finished the Basic Course, answer "Shrug" to Selmie to unlock the Advanced Course. 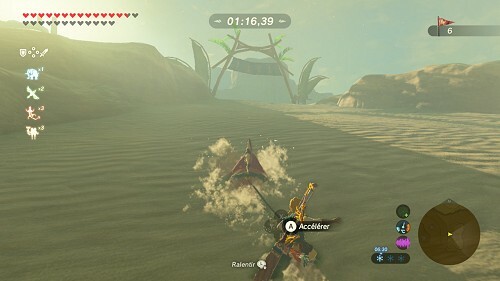 Tip: During the Advanced Course, after the rocky arch, use Revali's Gale to go down what remains of the track faster. 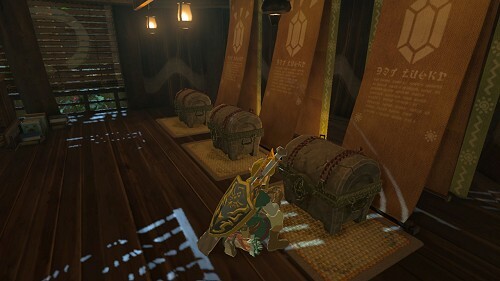 Remarks: On the three available chests, there is only one containing more than what you bet. Remark: There's no time limit, apart from your stamina container's capacity. Tips: There's no time limit so take some time to check the track. Start with the right track, a rising current allows you to reach the left one. Remarks: A huge stamina gauge, some energizing/enduring meals and the upgraded Climber Armor are very useful! 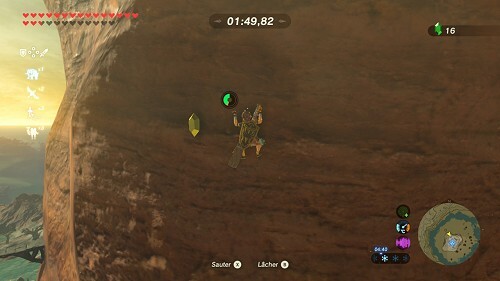 Tips: There are several silver and golden rupees along the way. 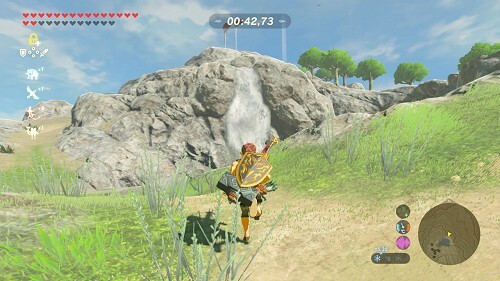 A simple track is to follow the green rupees, sideways towards the left as soon as you start, leading to a golden rupee. Tips: Before anything, light the lantern located right north of the stable, in order to save a lot of time! Because after that you only have to light your torch/branch at this lantern and to come back. Use a level three Hasty meal or elixir for the last part. And don't forget that you mustn't dash while holding the torch. Remarks: There are targets all around the central pillar and down the cliffs. 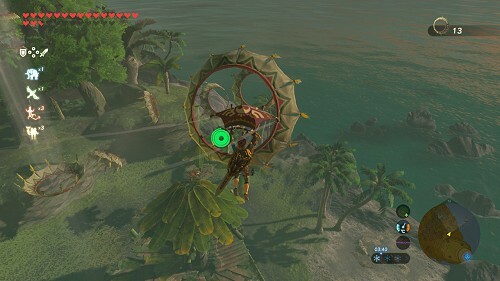 When your stamina container is empty by aiming so much, take out your Paraglider to get it all back. Tips: Take advantage of the "bullet time" effect when you're aiming to locate as many targets as you can. The bigger your stamina container, the easier the game. 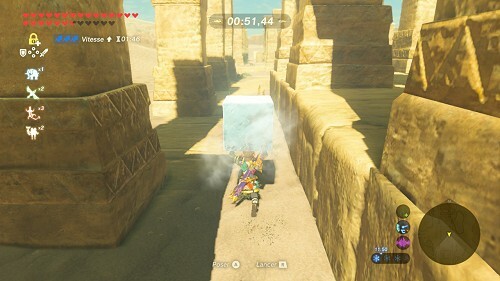 Remark: The faster you are and the bigger the ice block is, the more rupees you'll earn. Tips: Go round the ruins thanks to your Sand Boots to avoid the enemies. Or you can clear the place a bit before you start. Remarks: A seal is lended to you if you don't have one. Beware of the obstacles and the enemies along the track! Tips: Speed up at regular intervals but don't hesitate to slow down in the tight turns. Thanks to Mickael, Stormy, Neo, Mastroyal and Héloïse!